Are you tired of all the traditional flooring options like carpet, tile, and hardwood or even polished concrete floors? Want a flooring that is one of the most exclusive and exotic looking; a flooring that is out of the normal realm or flooring that you can be proud of? Well, if your one of the people who want the most customization they can achieve with flooring, we have great news for our neighbors in Austin. 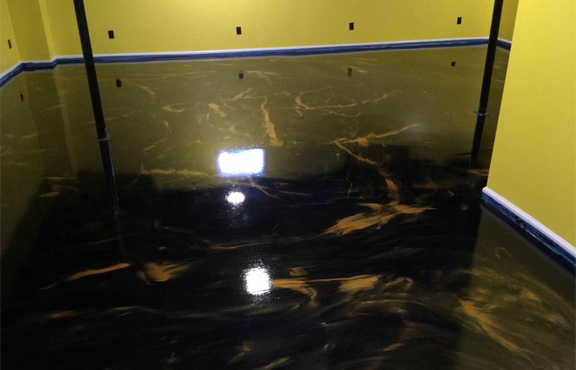 We are proud to announce that we are one of the few companies that offer the stunning metallic epoxy floor coating! 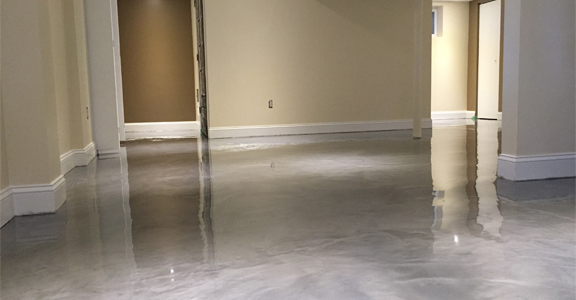 Our metallic epoxy floor coating will bring that much-needed excitement to any living area or commercial facility along with some benefits that can make your area more efficient and benefits that you didn’t even realize you needed! Allow us to tell you more about how our amazing metallic epoxy floor can benefit you as your next flooring system! A metallic epoxy floor coating in Austin follows the same basic principles of all other types of epoxy flooring systems with a few exceptions. The base mixture of a metallic epoxy floor is still a system that uses epoxy resins mixed in with polyurethane hardeners to make the epoxy resin cure. The system is 2/3s epoxy resin to a 1/3 of poly hardener just like a normal epoxy flooring system but the main difference is the addition of the metallic pigments that give the metallic epoxy floor coating its character. There is a wide variety of colored metallic pigments that can be chosen to be placed in the mixture and a number of different application methods to achieve the desired effects. The metallic epoxy floor must be applied using a squeegee but after it has been applied, the most popular methods of shaping the epoxy are done with backrolling additional pigments onto the surface or the use of solvents to create additional chemical reactions in the metallic epoxy floor coating. The metallic epoxy floor is one of the most unique flooring options on the market to this date and a lot of business and areas use this flooring as its go-to option. 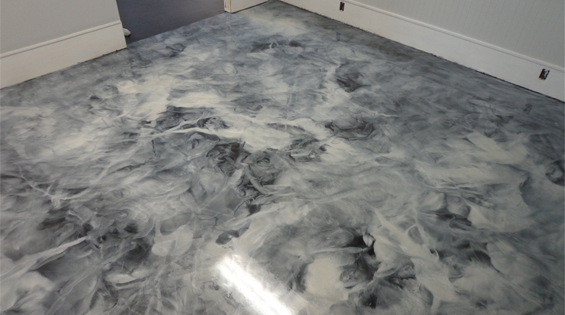 Below are only a few of the places you can see a metallic epoxy floor in person today. Metallic epoxy flooring has the unique feature of isolating all moisture on the surface so the concrete slab has no contact with any moisture. This meaning no dirty water or even chemicals are able to be absorbed by the concrete and released into the environment. The metallic epoxy floor coating also doesn’t use a heaping amount of stone, wool, or massive amounts of wood like other traditional types of flooring. So when it comes time to dispose of the metallic epoxy floor, you won’t have to fill an entire landfill to dispose of it. What most home and business owners in Austin love about our metallic epoxy floor coating are that is one of the easiest flooring options to maintain. This is because the metallic epoxy doesn’t require the use of waxes or polishes to shine, the shine comes with the top coat! 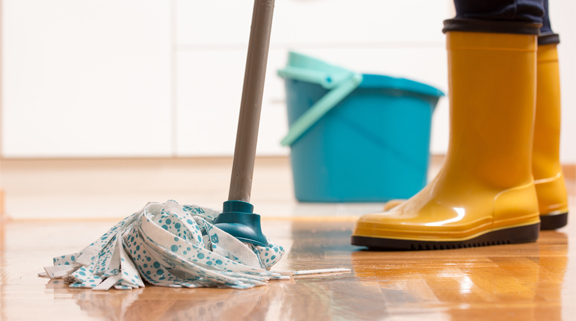 All that you will need to maintain a metallic epoxy floor is either a soft bristle broom or a dust mop and a standard wet mop to wipe the floor down! We recommend maintenance be done weekly in low traffic and daily when exposed to high traffic. 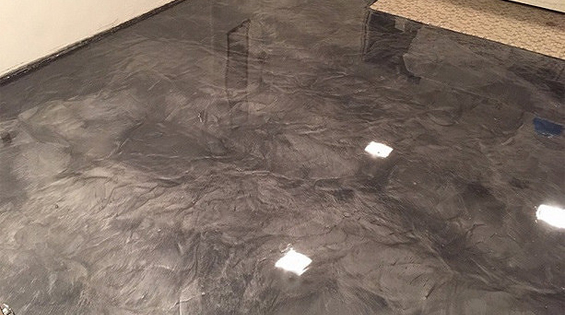 Since the metallic epoxy floor coating is so rare and chock full of benefits, installing one in your home can raise the value by the thousands! Think about it, not many homes have flooring that can mimic waves crashing in or flooring that looks like the clouds in the sky, people will pay more for an exotic flooring just like they do with flooring that has a fancy wood or a travertine floor. Metallic epoxy is one of the flooring options that you can expect to see an automatic return investment in by increasing the value of your home. Metallic epoxy flooring doesn’t give up any strength for the benefit of being attractive as a matter of fact, a metallic epoxy floor is actually stronger than it is beautiful. Metallic epoxy is a 100 percent solid epoxy system so your floor is strong enough to handle 3500 psi. Along with high tensile strength, epoxy flooring is almost impervious to the effects of high foot traffic, dropped objects and scratches or abrasions from daily life. Metallic epoxy has been proven to make the concrete slab up to 300 percent stronger than a bare concrete slab and that says something. The chemical resistance that epoxy flooring brings to the table is not lost either when you make the switch to a metallic epoxy floor. The top coat as stated before will make sure no chemicals are absorbed and leaked into the environment but this does more than protect the environment. When a concrete slab absorbs a harsh chemical, it can actually damage itself and lead to structural damage. Metallic epoxy floors are able to resist a variety of chemicals on its own but it can be altered to defend against specific chemicals as well with the help of additives. The metallic epoxy floor coating has a top coat that is able to work all types of magic when it comes to making benefits for your home or business. 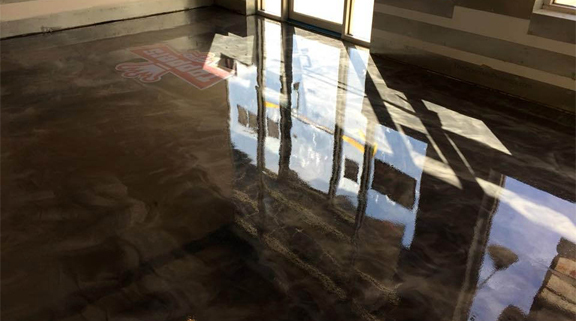 Metallic epoxy flooring in Austin is able to reflect light at such a high rate, it has been tested and proven to make an area up to 300 percent brighter all without the use of additional lighting sources. This can make the garage more welcoming all the way to making your facility safer by making it easier to spot objects on the floor. Metallic epoxy can do all this while saving you money on your power bill! If you have any questions regarding a metallic epoxy floor coating in Austin makes sure to give us a call today for a free quote!